If you’re like the average cord cutter, or the person thinking of cutting the cord, you’re tired of being tethered to your cable company. A big bill shouldn’t be (and isn’t) required to watch sports, movies, and other entertainment from your home or on the device of your choice. Of course, until recently it was required. Now we don’t have as many of those issues, thanks to streaming services. Services like fuboTV allow us to watch sports and other channels on the ready at a reduced price. The problem, at least for some, is that with a growing list of services it can be hard to keep up with what is the best option for their individual needs. 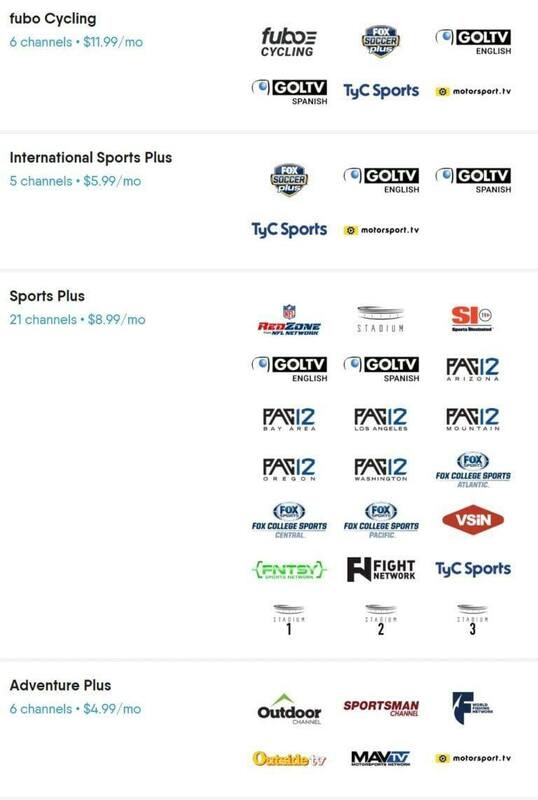 This fuboTV channels list should help! fuboTV is definitely a sports-centered streaming service, but as this fuboTV channels list will show you, they do offer channels (and add-ons) for everyone in the family. 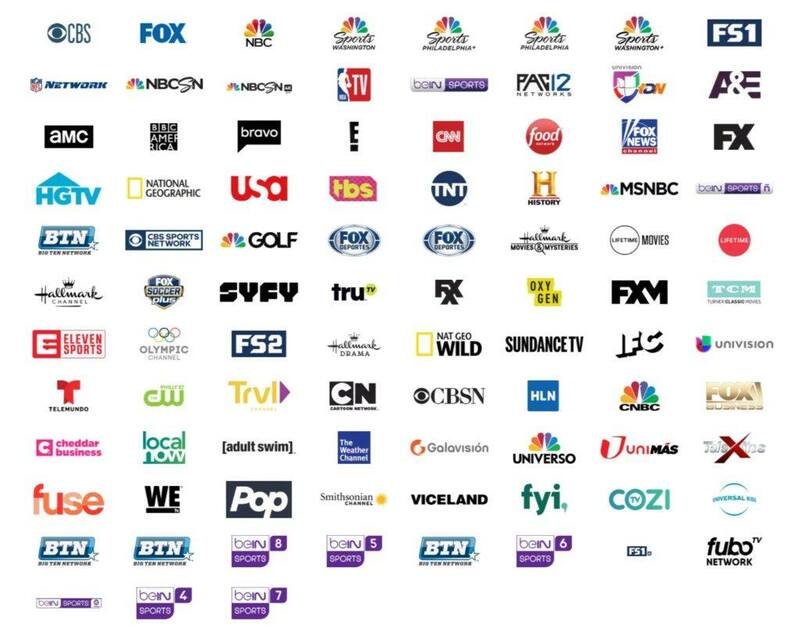 So, if you’ve been questioning what fuboTV channels are available, this guide should help you out. fuboTV is a sport-centric streaming service that offered sports streaming long before anyone else. 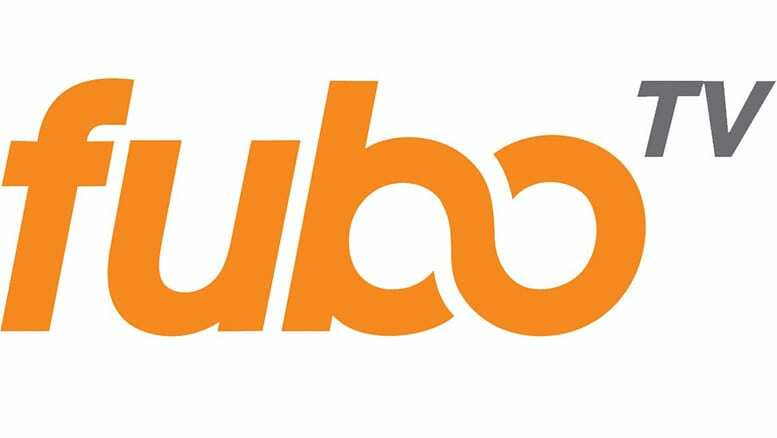 As a leader in sports live streaming, fuboTV offers local, national, and international sports events and channels as part of their fuboTV channel lineup. You receive a selection of sports channels, and since fuboTV has added more channels, you also receive non-sports channels now, as well. Both live stream and on-demand content is available. You can even add channels to your fuboTV channel lineup for a small fee. Your basic package is $54.99/month and includes a free 7-day trial offer. 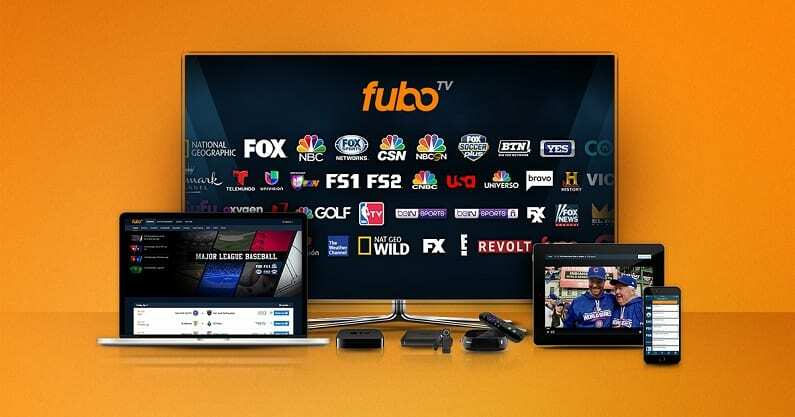 You can use a variety of devices to sign on to fuboTV including Roku, Chromecast, Apple TV, and mobile devices. As long as you’ve got an Internet connection and one of these devices, you will be able to watch fuboTV. It’s also worth noting that you won’t be asked to sign a contract. You pay by the month and get just what you pay for. If you don’t like the service or decide you want to cancel fuboTV, your membership will end once your month is up. Otherwise, if you cancel during the free 7-day trial it will end when the trial is up, and you won’t be charged for anything you’ve watched. You can learn more in our full fuboTV review. For now, let’s get to why you’re here and discuss the fuboTV channels. What Channels are Available on fuboTV? Live TV is awesome and it’s even better at a price you can afford. Streaming offers that peace of mind that comes from getting the channels you want without being forced to pay for the channels that you don’t. As you will see in our fuboTV channels list, fuboTV has a lot of great channels to offer, especially if you’re into sports. The add-ons are worth a consideration, too. fuboTV offers a couple different packages, which we’ll go over below. 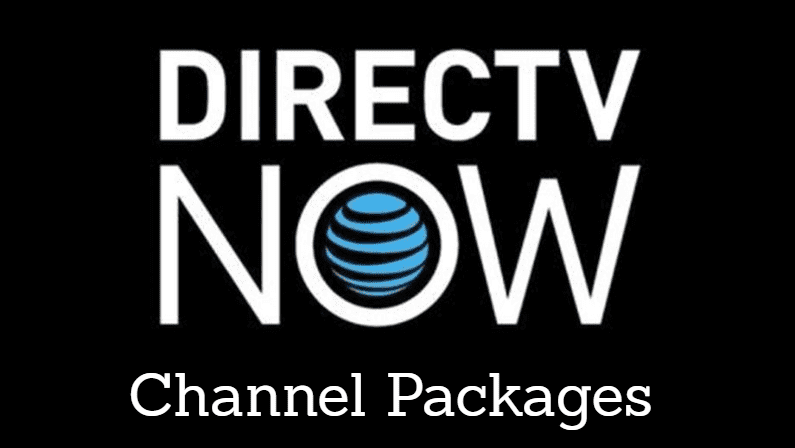 The fubo Extra package has everything from the base package, plus the channels pictured above. It adds an additional ~20 channels for an extra $5 per month. They are mostly entertainment (non-sports) channels. 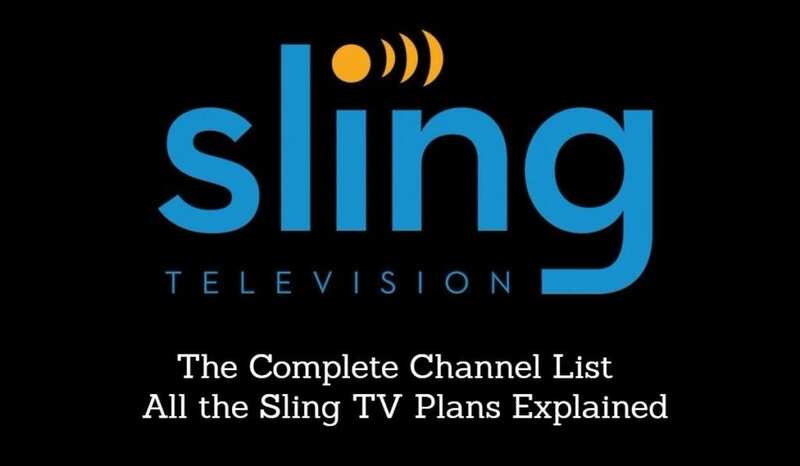 Channel list: Everything included in the base package, plus Cooking Channel, DIY Network, GSN, Sony Movie Network, People TV, Stadium, Insp, Revolt, Boomerang, CNN International, GinX eSports TV, CNBC World, BBC World News, Xite, Stadium 1, Stadium 2, Stadium 3, Tennis Channel, Xite xRock, Xite xVibe and BabyTV. Does the fuboTV Channel Lineup Offer Add-Ons? The fuboTV channel lineup includes several add-on packages. These are all optional, so it’s completely up to you if you want to add them and pay more, or not. These packages require a base package (so you can’t just get the add-on). In addition to these channels, there are also a few foreign language packs to choose from, including a Portuguese pack, Italian pack and Spanish pack. These bundles combine the base package with additional features, such as enhanced cloud DVR storage and additional streams, with a reduced price. The last one, Fubo Ultra, also combines the additional channels from the fubo Extra package. Does fuboTV offer Local Channels? fuboTV offers several local channels in a lot of areas of the country. CW is available in a few (8 markets), while MyTV is live in just 3. ABC is currently not offered via fuboTV. Here is a list of markets covered. You can also check during the signup process. Does the fuboTV Channels List Include Regional Sports? fuboTV is constantly expanding and adding new regional and local channels. If you don’t see your local network, you can check which channels are covered in your area during the signup process. And remember, fuboTV offers a FREE 7-day trial to test things out. What About Foreign Language Packages? 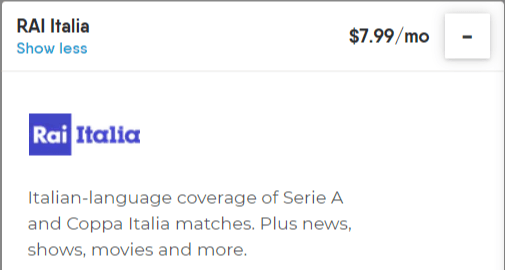 fuboTV also offers several foreign language packages. These are available as add-ons to existing English plans. How Does the fuboTV Channel List Compare? Compared to the competition, fuboTV stacks up fairly well. It’s obviously great for sports fans, with one important downside: there’s no ESPN. That could be a deal breaker for some. Other than that, the service offers an excellent assortment of sports channels. It also stacks up fairly well in terms of entertainment, news and more. It’s one of the best streaming services overall. 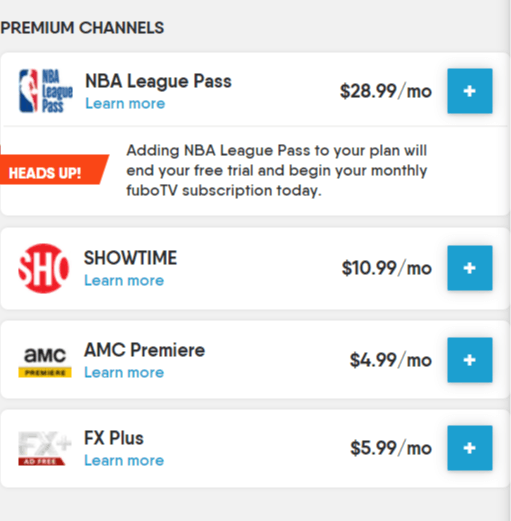 fuboTV’s $55/mo pricetag puts it in the same realm as most competitors. It includes a free 7-day trial, which means that you have nothing to lose in giving the fuboTV channel lineup a shot!